The NEPSE index as at Mid-June 2018 closed at 1247.3 points, a 21.28% decline from the same period last year when the figure stood at 1,584.5 points. 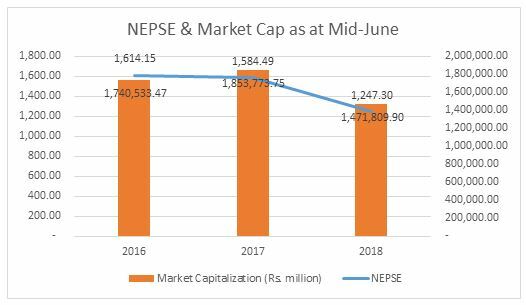 The market capitalization of NEPSE as well declined by 20.60%, from NPR 1,853.77 billion in Mid-June 2017 to NPR 1,471.81 billion in Mid-June 2018. Out of total market capitalization, the share of banks, financial institutions and insurance companies stood at 80.6%, hydropower: 4.6%, manufacturing and processing companies: 2.9%, hotels: 1.7%, trading: 0.1%, and others: 10.2% respectively. 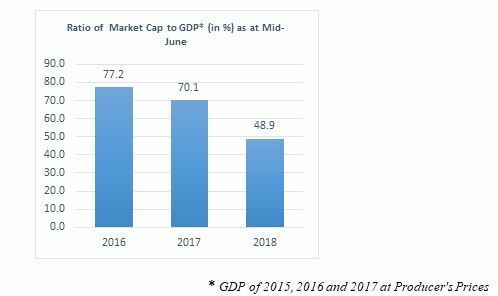 On the other hand, the ratio of market capitalization of NEPSE to GDP as at Mid-June 2018 has dropped down to 48.9% compared to 70.1% in the last year during the same review period. As shown in the chart below, the interbank rate of commercial banks has slightly declined to 4.18% in Mid-June 2018 compared to 4.53% in the previous month. In last seven months, interbank rate has stood above 4% level, which is on the higher end. It indicates that the commercial banks are facing difficulty in maintaining their CCD ratio and are in shortage of further loanable fund. The base rate of commercial banks is in increasing trend, which has reached one-year-high of 10.41% as at Mid-June 2018. The base rate was 10.32% during the previous month. And last year during the same review period, the base rate of commercial banks stood at 9.40%. As reported by NRB, the consumer price inflation had declined from 6% in Mid-March 2018 to 4.1% in Mid-May 2018, mainly due to fall in price of some essential items. In Mid-June, inflation has remained at the same level of 4.1%. The figure stood at 2.78% during the same period, a year ago. The current inflation index is at 120.3. Compared to base index of 115.6 in June 2017, the inflation is computed as 4.1%. However, the index at fiscal year-end (Mid-July 2016/17) was 115.9. So, based on this index, the inflation rate can be computed as 3.78% only. The average inflation index of eleven months of FY 2074/75 stands at 119.5. Thus, the average inflation rate of eleven months remains at 4.1%. However, the ongoing market interest rate on deposits or, government bond and corporate debentures can easily beat this inflation rate. Considering nominal interest rate as weighted average deposit rate of 6.61% (as at Mid-June 2018) and inflation rate of 4.1%, the real interest via Fisher equation is 2.51% only. 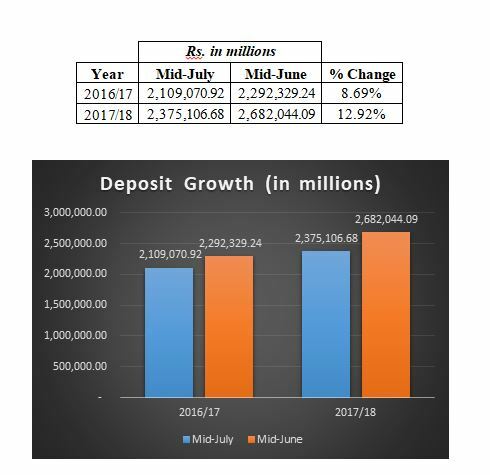 Deposit Growth: The deposits of BFI’s as at Mid-June 2018 increased to NPR 2,682.04 billion by 12.92%, compared to NPR 2,375.11 billion in Mid-July 2017. The growth during the same period last year was 8.69%. Out of the total deposits at the BFIs, the share of saving deposits decreased from 35.8 percent a year ago to 34.5 percent in mid-June 2018. The share of demand deposits increased to 8.6 percent from 7.9 percent, and fixed deposits to 45.7 percent from 43.4 percent a year ago. The share of institutional deposits in total deposit of BFIs stood at 44.32 percent in Mid-June 2018. Such share was 44.2 percent a year ago. 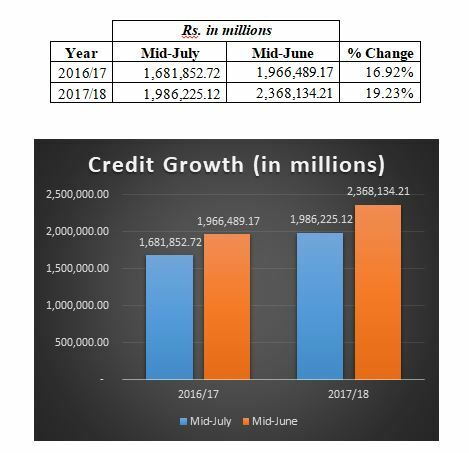 Credit Growth: The credit disbursement of BFI’s as at Mid-June 2018 increased to NPR 2,368.14 billion by 19.23%, compared to NPR 1,986.23 billion in Mid-July 2017. The growth during the same period during last year was 16.92%. Credit growth continues to outstrip deposit growth. However, deposit growth has gathered steam following the rise in government expenditure and a slight improvement in the growth of remittances. As a result, market interest rates have somewhat stabilized. Till eleven months of FY 2017/18, NRB has mopped up NPR 135.25 billion through open market operation, out of which NPR 42.35 billion was mopped up under deposit collection auction, NPR 3.15 billion through 14 days’ deposit collection auction under interest rate corridor, NPR 84.75 billion through reverse repo and NPR 5 billion through outright sale auction on a cumulative basis. In the corresponding period of previous year, NPR 101.10 billion liquidity was absorbed. In contrast, during eleven months of FY 2017/18, NRB injected Rs. 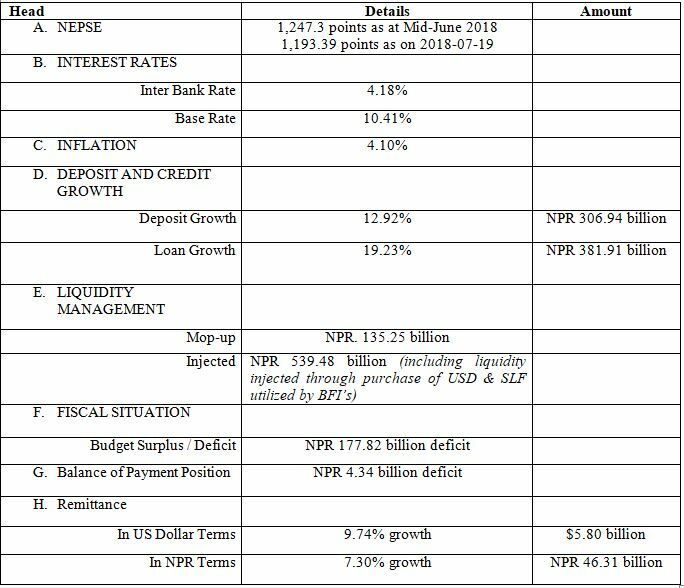 393.81 billion through purchase of US dollars, whereas NPR 107.34 billion was injected through repo auction and outright purchase in the wake of liquidity crunch in the banking system. The figures during the same period in the previous year were NPR 398.33 Billion and NPR 61 Billion. In addition, BFI’s had also utilized Standing Liquidity Facility (SLF) of NPR 38.33 billion in the eleven months of this fiscal year to further manage the liquidity in the banking system. The BFI’s had utilized such facility of NPR 62.39 billion during the same period last year. 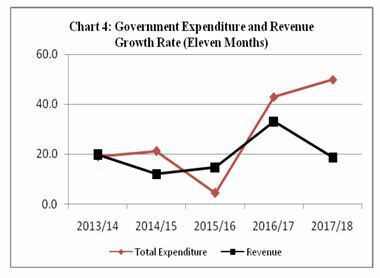 In eleven months of FY 2017/18, the Government of Nepal (GoN) is at a deficit of Rs. 177.82 billion in its budget compared to a deficit of Rs. 12.65 billion in the corresponding period of the previous year. In comparison to eleven months of FY 2016/17, the government expenditure has increased by 49.89% to NPR 832.04 billion. On the other hand, the government revenue witnessed a decline in growth to 18.71% compared to 33.08% in the corresponding period of last fiscal year. The government revenue for eleven months of this fiscal year stood at NPR 625.77 billion compared to NPR 527.14 billion in the eleven months of last fiscal year. The country’s BOP position is in deficit by Rs. 4.34 billion till eleven months of FY 2017/18, mainly due to huge deficit of Rs. 209.21 billion in current account as a result of significant increase in imports posing risk to external sector stability. During the corresponding period in last year, BOP was at surplus by Rs. 74.23 billion, whereas the current account was at deficit of Rs. 2.99 billion. In the review period, the flow of foreign direct investment (FDI) amounted to Rs. 15.88 billion compared to Rs. 12.27 billion in the corresponding period of the previous year. 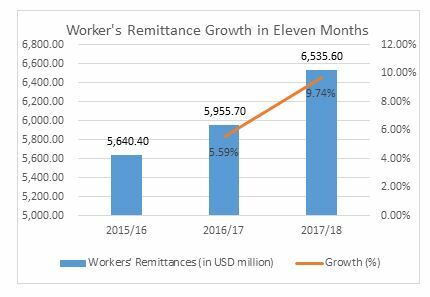 In US Dollar terms, the eleven months’ data of FY 2017/18 shows that worker’s remittance growth has witnessed an increment of 9.74% to reach $6,535.60 million compared to 5.59% growth in 2016/17. 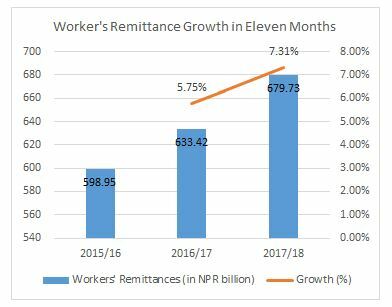 On the other hand, in NPR terms, the workers’ remittance increased by 7.31% to NPR 679.73 billion during eleven months in FY 2017/18 compared to a growth of 5.75% during the same period in FY 2016/17. As per the data of Department of Foreign Employment, the number of Nepalese workers seeking approval for foreign employment (except renew entry) fell by 8.2 percent in the review period. It had decreased by 3.5 percent in the same period of the previous year.